Move your 90's legacy app to the web - now! Go from the desktop to the web! 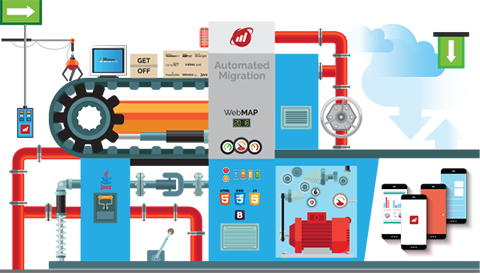 Mobilize WebMAP migrates VB and C# apps to a modern web application. You get native code with no runtimes, no binaries, no third-party dependencies. Schedule your phone call today. Go from VB or .NET to responsive web. Applications are refactored to modern, cloud-ready MVC/MVVM, with Angular/Bootstrap. No runtimes, no third-party dependencies.